Anybody who gives the flat earth idea the slightest amount of critical examination will realize that it's complete balderdash. Saying that 6 miles at sea should account for 24 feet of drop is nonsense: a sight line 6 feet above the water would meet the top of another 6-foot pole at 6 miles' distance if the earth were "flat." The container ship starts quite visible with most of its hull in view, but sailing away for an hour appears to sink gradually into the sea. Eventually the containers on deck and the ship's superstructure are all hidden behind the apparently rising water level of the sea. The smaller boats in between the container ship and camera are not rising and falling over huge waves, so the swells are quite small, about 2 feet. Can you refute this simple evidence? 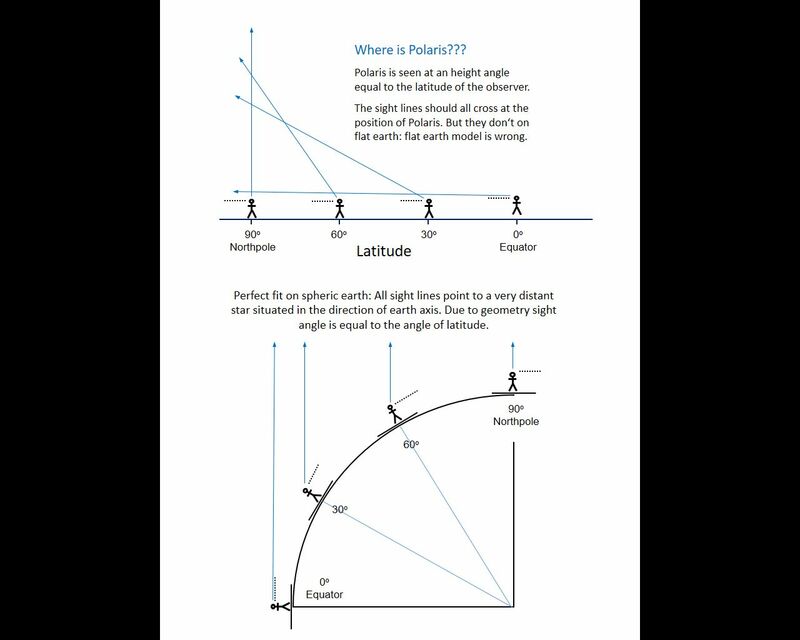 The website page below compares views of Polaris from various latitudes on a "flat" earth vs. a spherodial earth. The angle of sight from earth to Polaris is identical to the viewer's latitude on earth! All viewers are seeing the sun at the same time, so the sun must be located in the same place, consequently all viewers must be looking in the same direction to see the sun there. Does this support flat-earthism or is it rather supportive of a spheroidial earth? Can you refute this evidence that the sun is much further away from earth than the moon is? An excellent response to flat earth nonsense. It's painfully obvious that the sun doesn't twirl around above the earth the way flat-earthers claim. How would Antarctica get 24 hour sun if it did? And no, Polaris has not always been the Pole star in the past, nor will it be in the future. For at least some, their ignorance is willful and impudent, therefore quite repulsive. Well, you would have more credibility if you would avoid the frequent emotional outbursts. Given your obvious emotional attachment to a globe earth, it's difficult to take you seriously as an objective source of information or argument. So I tend to dismiss what you have to say as biased out of the gate. There is no curve to the sea because water surface doesn't magically hump-up higher in the center between two shores, nor does the surface of water ever curve. Water can slosh, but it always settles flat by nature. Everyone knows that 'sea level' is the horizontal foundation of measurement used in determining elevation of land height. It's how we know Mt McKinley is 20,310 feet tall. It certainly isn't a 'sea curve' based measurement, or there could be no certain measurement regarding the height of land. 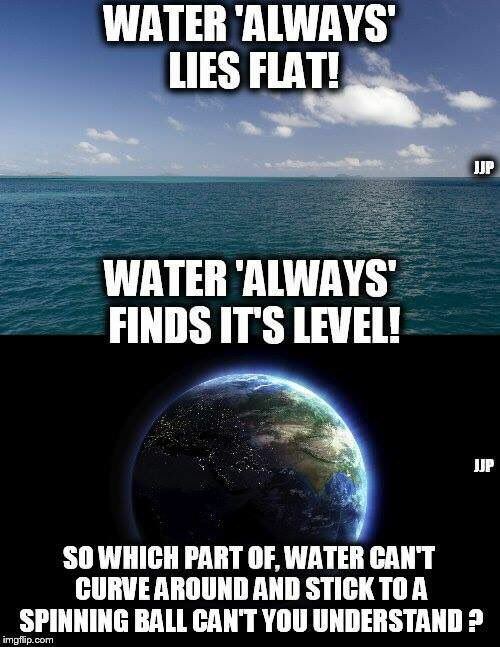 Level is level on a flat earth. Curve is curve. But on a globe, you relativists insist the terms are interchangeable, a proposition without foundation. Earth is not a globe. Neil Globestat just got taken to the Smackdown Cafe for lunch by Ladislaus. I hope your tendencies remain consistent with the Dogmatic Flatearthists on this site. For both sides, I am trying to take the evidence and examine it on its own. Just because I dismiss Neil as a biased source doesn't mean I don't look at the things he posts. It's just very difficult to filter out the core factual content when it's surrounded by 3 or 4 paragraphs of emotional ranting and insults. I'm considering the picture he posted in the OP to understand what its implications are. What I don't like is when people ignore something and then post OTHER evidence either unrelated or only tangentially related to it ... without actually addressing the main point. So, if someone posts a picture which appears to show curvature, then someone else posts a different picture that shows no curvature. If both pictures are genuine, then there must be an explanation for why one of them isn't proving what the poster claims that it does. So, for instance, a globe earther will show video of a boat getting lower and then disappearing as it moves away from the observer. But then flat earthers have shown convincing evidence that this can APPEAR to be the case even when it really isn't ... if you zoom in on the boat with some magnification. So they have demonstrated that the visual appearance of something sinking beyond the horizon doesn't prove globe earth ... since it can just be an optical phenomenon. So this is the kind of analysis I'm trying to do ... amid all the emotional noise on either side. Neil at one point posted video of SpaceX as if it proved globe earth, but then flat earthers provided convincing evidence that the pictures were fake/CGI/something and could not have been genuine. Does that prove flat earth? No. But it showed that that particular piece of evidence from globe earthers was invalid. Now, on the other side, I've seen pictures taken by objective third parties of mountains that could be seen from WAY TOO FAR AWAY given curvature math. These were from people who had no interest in disputing globe earth. I've seen pictures of other objects that would not be visible at the stated distances. And there's only one explanation from globe earthers ... refraction. 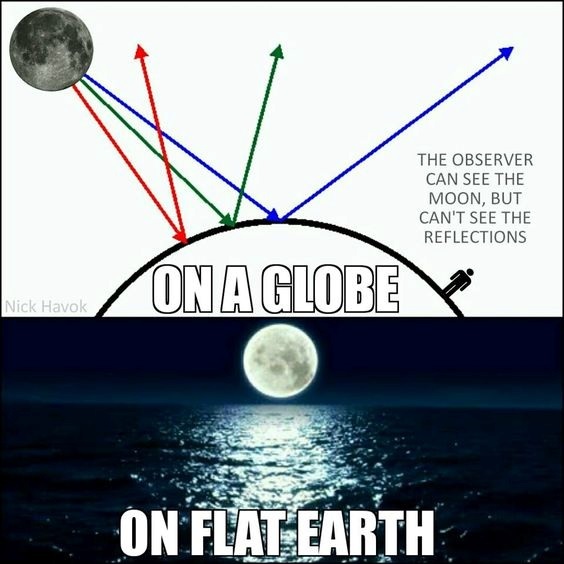 If you're a globe earther, you assume that there MUST have been refraction (because of your premise that the earth is a globe). If you're a flat earther, you assume that there was NOT refraction involved. If you're trying to find the truth, then you sit here wondering whether there's a way to prove or disprove refraction. So the ultimate problem is that, when you've already made up your mind almost dogmatically about something, then you selectively interpret and filter out evidence that seems to oppose your viewpoint. Let me take this first one. Neil asserts this video as proof of globe earth. He opens with the assertion that flat earth is "complete balderdash". Then he offers evidence, the video of a ship appearing to disappear into the horizon. This is claims is "simple evidence". But I have seen many videos produced by flat earthers which appears initially to show the same phenomenon, a ship disappearing into the horizon. Then additional magnification is applied, and the ship reappears ... demonstrating that the initial disappearance of the ship was an optical phenomenon and not due to earth curvature. So, in order for this video to constitute "simple evidence", Neil would have to rule out the same demonstrable optical phenomenon having been at work in this video. He does no such thing, so I reject his "simple evidence" as inconclusive non-evidence. It's pretty clear. Problem is that when you have an emotional attachment to one or another outcome out of the gate, you skip logical steps and then in your mind this proves something that needs not proving (since you already believe in it beforehand). But does it objectively prove it to a third-party objective observer like myself? No. And when Neil adduces something like this as proof when it's objectively NOT proof, that undermines his credibility as a reliable source of argument or information. Everything he presents must now be sifted through with a fine-toothed comb. So let me do the same analysis on this one (on the other side). 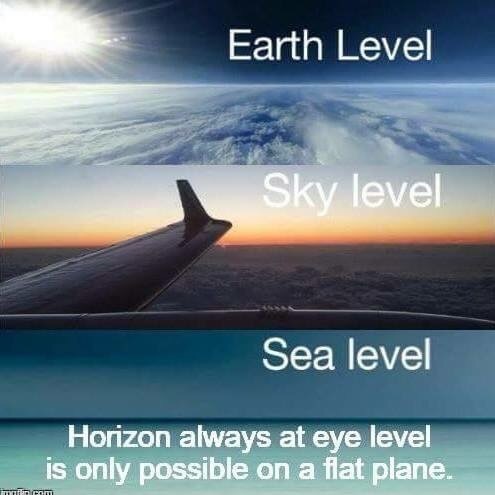 This assumes the princple that the "Horizon being always at eye level is only possible on a flat plane." #1) is it provable from these pictures that the horizon is actually at eye level? These are pictures, so could the angle have been changed so that it only appeared that the horizon is at eye level? If the horizon were below eye level, and I tilted my camera slightly downward, would that make it seem as if the horizon is at eye level even if it's a bit lower? #2) is it really true that the horizon always being at eye level is only possible on a flat plane? Well, I believe #2 to be correct based on some other videos that I have seen on the subject ... which seem to demonstrate this visual phenomenon. But it's not proven just by this picture alone. And then there's a question of how the pictures were taken or produced. So this is presented as proof, but it does not prove anything on its own. Also, when I was researching it, there wasn't a thing I found that FEers claimed that couldn't be refuted by GEers. I'm not saying that everything was super solid, but adequate in my mind. Conversely, there were things that FEers just didn't have an answer for. You see, my impression was the other way around. Almost every answer from GE involved "refraction". And it seemed like the debunkers were LOOKING for reasons to prove that which they already knew to be true. Same thing from the other side to an extent. Overall I found the FE evidence more convincing. At some point I might list the arguments that I found most convincing. I hope your tendencies remain consistent with the Dogmatic Flatearthists on this site. In fact, one would be hard pressed to find someone here who isn't dogmatic about it, who favors flat-earth. I can't help but hold animosity towards the FE position merely because of the words written here by the "Catholics" who push it. I am usually inclined to be open to counter-mainstream arguments and "theories" and that's the reason I didn't dismiss FE right away. It wasn't until I saw the people here pushing it and how they were doing it, that I realized this has got to have diabolical roots. All this has been covered, and more. Whether you believe it or not, it is a cohesive and well founded argument expounded upon as a whole in these threads. The information is verifiable and remains a tower against whatever spit wads you lob at it. Not one of you globalists has offered anything but sporadic contentions, parroting anti-Catholic sentiments of the globalists. You offer a piece meal defense against a juggernaut of spiritual and physical truths. 100% of the time your claims are "no, it can't be that way" or "you're stupid", rather than explaining how you shamelessly promote what the New World Order globalists do. You literally sneer at information we've provided, but most importantly, you do it without consideration. A reasonable person digests information before he spouts, asks questions, takes the time to get to the bottom of what is being said. That NEVER happens with dyed in the wool globers, proving that indoctrination warps minds. 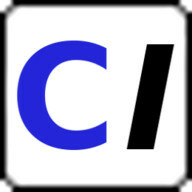 Modernism has been described as a system of thinking that enables one to reconcile within himself two opposing beliefs. Globalism is the poster child for modernism and remains a scientific relativism that is undermining Christendom. Here's one simple, easy-to-understand article that, I believe, explains away the Horizon argument. It's real short. Let me know what you think. This quote from the article is how I perceive this whole FE movement. "Because those susceptible to these psychological techniques feel special and incredibly intelligent for having uncovered the largest and longest conspiracy in the world and outsmarting every scientist who has ever lived, many simply never look for any evidence contradicting this deception before rejecting over 2000 years of scientific inquiry on the shape of the earth!" We're not talking about vanishing point. I've seen demonstrations of how a visual convergence happens between the plane and the object well before it reaches its vanishing point. An article like this I give little credibility to because it's emotionally charged, repeatedly referring to flat earth "deception", "deception techniques", attempting to win over "the gullible into their cult". I've seen pictures where JUST THE BOTTOM of the ship disappears, i.e. it's not reached its vanishing point, and then when you zoom in you can see the entire ship again, including the bottom. So the fact that this article makes it about "vanishing point" ... well, it's creating a false straw man argument. Consequently, it's the author of this article who's guilty of deception. I do not have a lot of God-given talents, but I am very skilled at shredding bad arguments to pieces. I can see logical flaws miles away and rip them apart in seconds. Other than that, I have a very poor memory, and not very many talents in other areas.